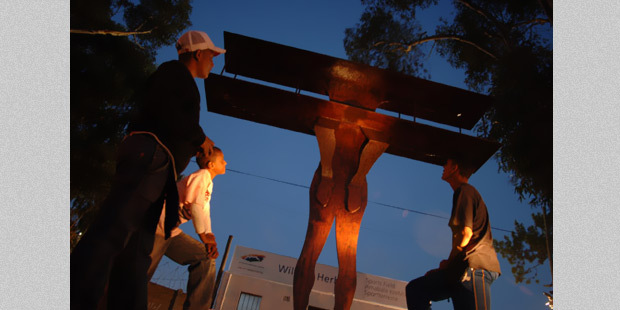 Teenagers in Wynberg, Cape Town, inspect the memorial to the first trans-Africa flight. On March 20 1920, Pierre van Ryneveld and Quintin Brand touched down at Youngsfield, Wynberg in a De Havilland DH9 - the first trans-Africa flight from London to Cape Town. Several other British teams had set out to pioneer this new air route, but each had crashed and abandoned their effort. Van Ryneveld and Brand crashed two planes en route - one in a forced landing in southern Egypt, the other during take-off in Zimbabwe. Prime Minister Jan Smuts was determined that the South Africans should succeed and each time ordered replacement aircraft to be sent to them. The pilots, who were knighted for their achievement, spent 109 hours and 30 minutes in the air, though the journey took 45 days. Read J McAdam's detailed account of the journey. 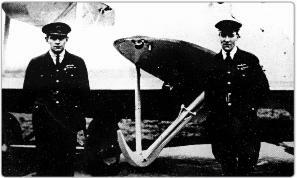 The record-breaking journey of Pierre van Ryneveld and Quintin Brand, who pioneered the first flight from the Brooklands aerodrome in England to Cape Town in swashbuckling style. Veronica Brand, daughter of celebrated aviator Sir Quintin Brand, shares with Sue Valentine some of her father’s personal tales of the daring capers during the first flight across Africa — from England to Cape Town. Who is Strijdom van der Merwe? Strijdom is a South African award-winning land artist who uses materials he finds on site to create his artworks. His materials include sand, water, wood, rocks and stone. Memories of childhood and boys' adventures informed Strijdom van der Merwe's thinking as he developed the artwork concept. "The pilots spent 109 hours in the air, but the journey took 45 days and two plane crashes." A lesson plan for this memorial will be added to the website soon. Crowds and crashes abound in our collection of images of Van Ryneveld and Brand’s 1920 flying feat. Get closer to Strijdom van der Merwe’s memorial to the first flight from England to South Africa.